So, I'm sure that regular readers of this blog are familiar with my total lack of time reality. But just in case you might be thinking, "Hey, that Dan guy sure seems like he's on top of things time wise! "* I give you the following example. 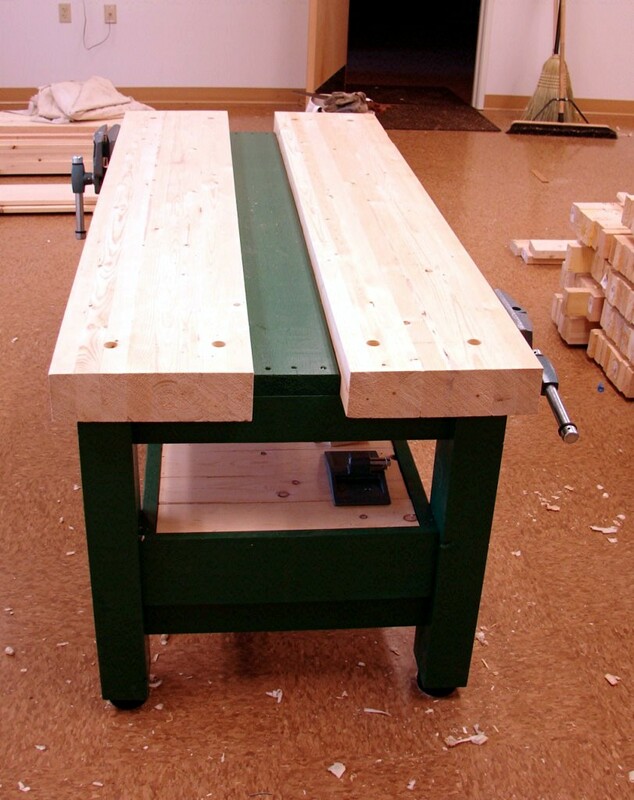 My self established goal was to have 7 student created workbenches in our school shop by the end of 2010. How did I do? Well, not too good by that benchmark (err...sorry). It's June of 2011, school is out for summer, and we have one bench 99% finished, and 6 more somewhere around 50% finished. Of course, in the big picture things are much, much better than that. We now have approximately 70 students who know how to measure, saw, glue, and plane. There's more: they have also been introduced (watching only) to sharpening plane irons by hand; they can bore with bit and brace and hand drill; they know the difference between jointer, jack, smoother and scrub; they have experienced the joy of shavings; they have discovered the satisfaction of working with their own hands to make something beautiful, useful and real. And as a bonus, they can explain (and debunk) numerous theories on the infamous saw nib! So who cares if my original goal was not met - it was entirely unrealistic in the first place. It's the process, not the product - the journey, not the destination. 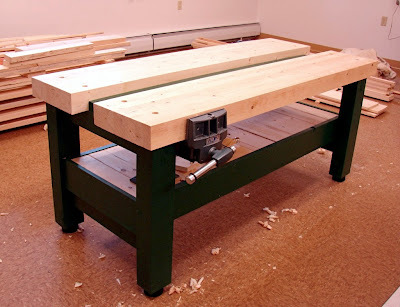 The bench is 5 1/2 feet long and the two separate tops are each 12" wide, which with the tool tray makes the whole thing about 2 1/2 feet wide. The tops are about 28" from the floor. The slats on the shelf conceal about 120 lbs of cement pavers spanning between the "L" shaped stretchers; combined with the robust build of the bench, that makes these quite heavy. I went with the split top with tray for a couple of reasons. First, although I don't like a tool tray for myself, I think with students, it will help protect tools from falling off the benches. Second, the tray down the center creates a boundary for each student and should keep bench space evenly divided. Of course, when needed, the tray can easily be spanned (or filled for that matter) to utilize the full width of the bench. This bench also features an updated version of the hockey puck leveler feet. I'll post more details on this later, but here's a quick summary of the new, much simpler system. First, I bored holes in the bottom of the legs that were slightly deeper than the length of a 5/8" all thread connecting nut. The holes were sized to be slightly smaller than the nut, which was then hammered in for a tight fit. The adjustable part is a 5/8" carriage bolt which is the same length as the nut. The rounded head sits in a shallow hole bored into a hockey puck, with the square shank "nut" part still above the level of top of the puck. This allows for an open-ended wrench to slide in and turn the bolt for very easy vertical adjustment. No jam nut, no washers, no lifting of the bench and puck removal to hold the bolt from rotating... I wish I had thought of this years ago - just simple and effective. All that remains to do (the 1%) is to plane the ends (they are just straight from the saw), have each student stamp their initials into each piece they cut, plug the bolt holes in the top, bore the holes for our Gramercy holdfasts, do a little more flattening, and make wooden faces for the vise jaws. That might seem like more than 1%, but you'd be surprised how much work/time is already vested. Oh, and the shop wasn't really that empty - we're getting ready to move it down to the ground floor. Slab floor - no more bouncing! Yay! Exterior door - easy wood handling! Double Yay!